We hope that you're observance of Paryushan / Das Lakshan was reflective and nourishing. As we kick off September, we would like to share with you announcements and updates regarding community events and new opportunities to get involved! 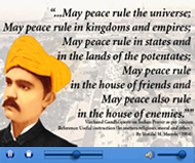 Aug 25th marked the 150th birth anniversary of Shri Virchand Raghavji Gandhi (VRG). VRG was a pioneer in bringing the awareness of Jainism to the West during his iconic speech at the World Parliament of Religions in September of 1893 in Chicago. The VRG Committee has put together a number of resources to help you learn about VRG's legacy and contribution to Jainism and the Jain community. A film by Pankaz Chandmal Hingarh, called "Salute to Son of India: Shree Virchand Raghavji Gandh" by clicking on the image below. and to read more about Virchand Ragavji Gandhi, go to: www.jaina.org/virchandgandhi. II. 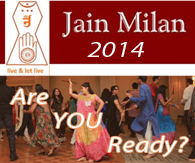 JAIN MILAN UPDATE - Last Day to submit your info for the Bio Data Souvenir Book was Sun. Sept 7! We are now 200% attendance from last year! JAINA is proud to announce Forgiveness Day on Sept 13! The practice of seeking forgiveness and forgiving others is a critical aspect of Jain practice. In the spirit of expanding awareness of Jainism, we are in the process of creating official days of observance for the Jain community and beyond. Stay tuned for more information about Forgiveness Day as well as other JAINA Days: Non-Violence Day (Oct 2) and Compassion - Jiv Daya Day (Nov 28). This year, Claremont Lincoln University will be hosting the 3rd International Jain Conference in Claremont, CA from Oct 2-4, 2014. On Oct 2, the 2nd Annual Ahimsa Award will be bestowed as well as showcasing Ahimsa Teachers with the theme of Explore, Perform,Transform, Be Formed. The Conference with the theme of "Business Ethics" will be Oct 3-4. In the spirit of providing education on ways to deepen your practice of non-violence, JAINA is hosting events at Jain Sanghs across the United States and Canada, in honor of World Vegan Day. There will be activities on either Sat, Nov. 1 or Sun, Nov. 2, which will comprise of interactive activities and shor talks by experts on exploring the connections between veganism, Jain values, and topics such as health, social justice, environmentalism, and more. Please check our Facebook Page for ongoing updates or email the World Vegan Day team at worldveganday@jaina.org. Go to www.convention.jaina.org for more information or email convention2015@jaina.org for questions or concerns. The JAINA Long Range Planning (LRP) Committee is offering paid fellowships for one year terms, from October 2014 to September 2015, to high school, college or post graduate students interested in the advancement of Jain values in North America. This fellowship will provide an opportunity for individuals to develop the leadership skills required to contribute lasting impacts on community building and social change. NOTE: This opportunity is only available to those in the United States and Canada at this time. For questions or concerns, please email fellowsprogram@jaina.org. Are you passionate about making a difference for the Jain community? Would you like to learn and develop new skills while doing so? Are you a leader who enjoys collaborating with other leaders? Then join the JAINA Volunteer Corps (JVC) today! We have just launched this new program for those who would like to contribute to the greater good of the Jain community and beyond. NOTE: This opportunity is currently only available to those in North America. Go to www.jaina.org/volunteer to fill out our form or email volunteer@jaina.org to learn more. For $14.99, give the gift of education and awareness to the child(ren) in your life. This is JAINA's first sponsored children's book to create awareness of Mahavira's message of compassion to all beings. Whether you are a passionate parent, aunt / uncle to a 'little one', mindful educator, or a member of your local library and would like to create awareness of Jainism to your local community, this is the book for you! The vision behind this project is spread Jainism's message beyond the non-Jain community. NOTE: If you have purchased your book, but have not yet received it, please email jainahq@jaina.org and we will be happy to help you. Delays may be due to the recent observance of Paryushan / Das Lakshan Holy Days. To purchase your copy, click on the button to your left. To volunteer for the team, email Dr. Manoj Jain at mjainmd1@gmail.com. View their latest newsletter for all of their updates. As you can see there are a variety of events, initiatives, and projects that JAINA takes leadership in creating in order to bring value to you and the Jain Community. The creation of new projects and the sustainability of current ones are ONLY POSSIBLE by the generous donations of the members like you.